I promised myself I would not overdo it at Iron Fork this year. But there was so much good food and drink—that promise was quickly broken. 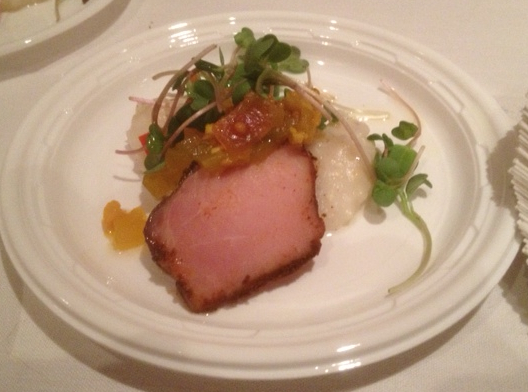 The pork loin from Dressel’s (shown above) was served with grits and chowchow. Tasty! 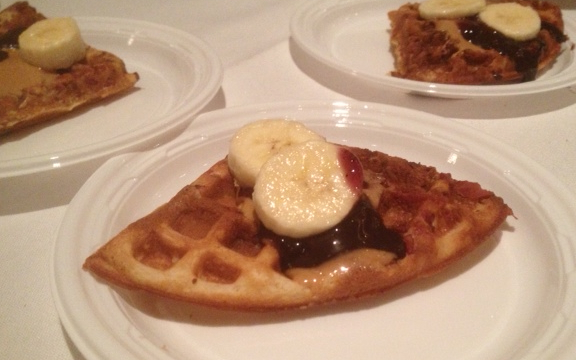 The Elvis Waffle (above) from Melt was a crowd favorite. Central Table Food Hall brought delicious scallops (above). 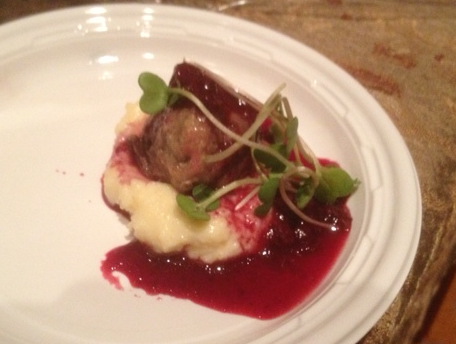 Home Wine Kitchen served up a veal meatball with a neat blueberry sauce. 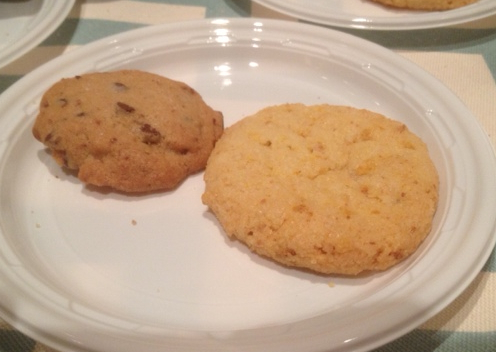 Whisk Bakery offered up a Chocolate Chip Cookie with Bacon and a Popcorn Cookie. Both very good! 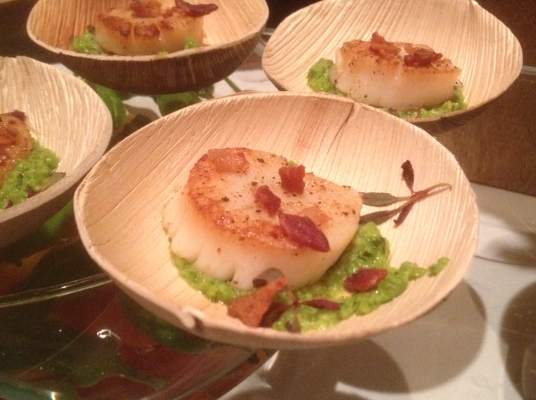 Thanks to everybody who shared your food and drinks at this year’s Iron Fork event! Y’all did good! On Monday, April 28, The Melting Pot of Town and Country, is hosting a “fondue-raiser” for Missouri Families for Effective Autism Treatment (MO-FEAT). For this benefit event, 100 percent of proceeds raised will go to MO-FEAT. Karen Barnett is co-owner of the T & C Melting Pot and the parent of a child with autism. The 4-course dinner will include a cheese fondue opener, a fresh salad, a “succulent entrée with fresh vegetables,” and a chocolate fondue dessert. Cost is $65/person and that includes your tip. A cash bar will be available. Silent auction and raffle items will help raise more money. First seating on 4/28 will be at 5:00 p.m. Make reservations by calling 636-207-6358. For more info, click HERE. If you attend events like this week’s Iron Fork at Union Station or June’s Saucy Soiree at the Four Seasons or St. Louis magazine’s A-List party in July in the CWE, you need strategies. What do you want to sample? I enjoy trying things that are new and unfamiliar. Tasting longtime favorites is enjoyable, but a unique offering from a newer purveyor is more likely to produce a lasting memory. How much do you want to eat and drink? I try to avoid getting quickly stuffed. Bread and beer are filling. If you get, say, a piece of brisket on a bun, toss the bun and enjoy the meat. Should you pick up a food sample that is less than delightful, you don’t have to eat it all. If you choose to booze… there will be wonderful beers available. 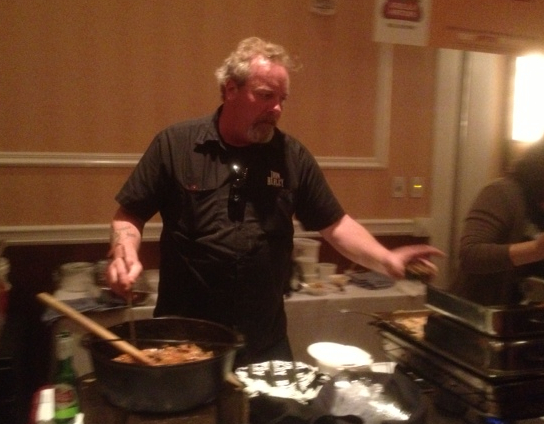 But I try to limit beer consumption at tasting events because, for me, it is more filling than wine. How do you know which of the longer lines are worth the wait? Ask people. Almost all attendees love to talk about the foods they’ve enjoyed most. Is it okay to get seconds? Generally, yes, although I don’t recommend it—for two reasons: (1) Each restaurant has a finite supply of food. (2) When you’re waiting in line for another taste of something you liked, you’re missing out on trying something different. How do you avoid being overwhelmed by it all? Take notes. A quick memo to yourself on your phone’s notes app can help you recall highlights. Taking pics of the best-looking offerings also helps aid your recall. Many participants will have business cards or menus for you to pick up. Remember that while these are food and drink events, they are also people events. Offer compliments to the folks whose food and beverages make you happy. Take a moment to greet old friends you encounter as you rush to the next food station. Honor the preferences of the person(s) you’re attending with. Should you run into the people who have organized your tasting event, be sure to offer thanks for all their efforts. It’s a big job! For full details of Thursday night’s Iron Fork tasting event, click HERE. Here’s the trailer for a new Mac and Cheese cookbook, Melt! Click HERE for more on Melt, including how to buy this book. 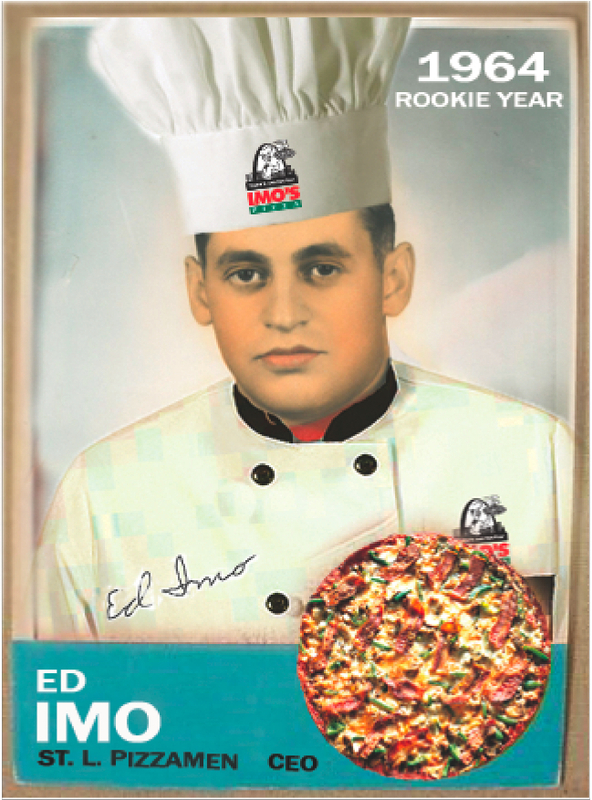 Imo’s Pizza is marking its 50th anniversary this year. They have printed up some cool Ed Imo baseball cards for the occasion. You may have looked at this card and thought, “I want one!” Not that easy. Each Imo’s store throughout Missouri and Illinois will receive 1,000 Ed Imo rookie cards for distribution in March and another 1,000 in April. Each week, 250 customers at each location will be chosen at random to receive a card with their purchase via delivery, carry-out or in-store dining. When a customer receives his or her card they need to register it online at http://www.imospizza.com. This will then qualify them as eligible to win one of several nice prizes, including sports trips and tickets. Congrats to Ed and Marge Imo on this big milestone! A Taste of Fiction is a fundraiser for St. Louis Public Library featuring pastry items from several St. Louis area chefs. The chefs have been asked to “interpret literary works in pastry.” Adult beverages will be served. 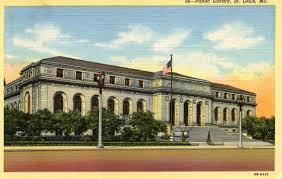 The event on Friday night at St. Louis Public Library is SOLD OUT. But you can check out the creative creations on Saturday (3/8/14). You can also meet and greet Robbie Montgomery of Sweetie Pie’s on Saturday afternoon. Click HERE for details.